O Victory, Where Is Thy Death? In the opening scene of “The Velvet Touch” (Independent Artists/RKO Radio Pictures, 1948), Rosalind Russell, as Broadway diva Valerie Stanton, ends a heated argument with her producer/lover Gordon Dunning (Leon Ames) by braining him with the first heavy object she can lay her velvet-gloved hand on. The irony is perfect, for the weapon is a theatrical trophy: it is the coveted Players Award, which Dunning won for Excellence in the Theatre; moreover, it is a statuette of Nike, Goddess of Victory, who bears aloft a wreath. The eminent actress has therefore crowned the eminent producer with his own laurels; the blow to his head has felled him for keeps: now needs must Gordon Dunning rest upon his laurels until the edge of doom. I find it all wonderfully funny. And after all, it’s Leon Ames: he had it coming. We’ll learn more about why as the picture progresses. Here’s a fraction of that opening scene. Much of the rest of the picture is spent in flashback, à la Film Noir (though “The Velvet Touch” is too glossy and high-tone to be so categorized), by which means we learn how Leon and Roz arrived at this fatal contretemps. That he cannot bear the idea of being left for another man, Michael Morrell (played by Leo Genn, who murmurs drolly from the first reel to the last), is the most obvious explanation for his unbecoming conduct. But sexual jealousy is only at the surface: there’s a much deeper reason for his fury, and it stems from a classic case of one of Hollywood’s favorite fictional psychological disorders, which may fairly be called Svengali Syndrome. Get Thee Behind Me, Svengali! In Hollywood pictures about the theatre, directors are invariably Svengalis: Warner Baxter plucks Ruby Keeler from the chorus line in “42nd Street,” and, by dancing her off her feet for a day and a half, turns her into an overnight sensation. In “Twentieth Century,” Oscar Jaffe (John Barrymore) makes a brilliant actress out of an awkward, infantile amateur named Mildred Plotka (Carole Lombard). Similarly, in “Maytime,” Barrymore (this time as the crackpot musical genius, Nicolai Nazaroff) turns Jeanette MacDonald into an international prima donna, then shames her into entering into a loveless marriage with him, and in the final reel, the enraged impresario aims a pistol at his rival, Nelson Eddy, and blows a hole through that worthy’s barrel chest. (Well, somebody had to do it.) Clark Gable transforms Jeanette from a hymn-singing ninny into the toast of the Barbary Coast in “San Francisco“: her swinging rendition of the title song apparently sets off the Frisco Quake of Aught-Six, which knocks the nobs off their hill and makes toast of the entire region. In “Lady with Red Hair,” the great Claude Rains, as David Belasco, turns the hopelessly inadequate Mrs Leslie Carter (Miriam Hopkins) into . . . Mrs Leslie Carter, who was known as “the American Sarah Bernhardt.” In “Hello, Frisco, Hello,” international songbird Alice Faye bends over backwards to rescue the scoundrel John Payne from ruin because she believes she owes her success entirely to him. In “All About Eve,” the aging star Margo Channing has a pretty shrewd estimation of her own gifts and self-sufficiency as an actress, yet when her understudy/rival, Eve Harrington, gives a sensational audition, Margo bitterly accuses her director/lover, Bill Sampson, of being responsible for the girl’s stunning performance, which was “carefully rehearsed I have no doubt, over and over, full of those Bill Sampson touches!” (When Eve goes on to win the Sarah Siddons Award for her performance, Eve herself clearly believes the director is responsible for her success.) Most miraculously of all, Dan O’Herlihy turns Lana Turner into the most scintillating actress on Broadway in “Imitation of Life.” We don’t see how he contrives to fashion a silk purse out of that sow’s ear, nor do we get a chance to judge his wizardry for ourselves: Douglas Sirk knew better than to show Lana giving what we’re expected to believe is a great theatrical performance. L: Barrymore instructs Lombard in the art of acting. R: Rains instructs Hopkins. 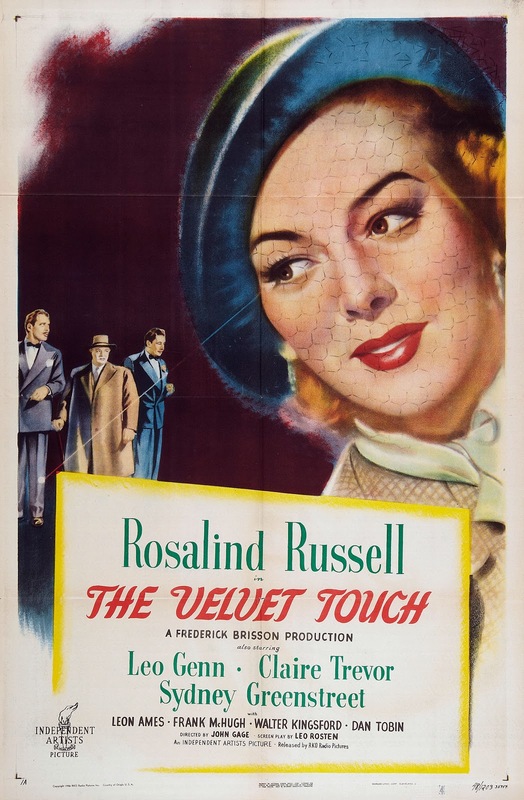 As we have seen, when “The Velvet Touch” begins, Rosalind Russell has grown a-weary of dancing on the ends of Leon Ames’ strings; she is determined to play Hedda Gabler in the upcoming season; she is newly in love with Leo Genn. She must therefore cut herself free from her puppet-master’s strings. But, in the great Svengali tradition, he would sooner ruin her than let her go, and sooner than ruin her, he would bring her to heel. So this native son of Portland, Indiana, brings out the big guns: “Yer not good enough fer heavy drammer.” Besides, he tells her, that sort of guff don’t go over with the “suckers,” as he calls the New York City audiences who have made him rich. He knows what slops to serve up to the moron millions, and, sister, Hedda Gabler ain’t no state fair attraction. He will not permit her to make a fool of herself . . . or him. To that end, he has leaked a story to the press that she has already signed on to do yet another frivolous romp in the Fall, and he’s willing to go very much further to keep her dancing to his tune and starring in his productions. We get a clear sense of the sort of shows he produces from the framed posters on his office walls: “It’s a Gay Life,” “The Gay Lady,” “Scandalous” and the current season’s “Escapade.” He produces and directs these wafer-thin entertainments, yet his theatre and his offices, tricked out with ostentatious, ornamental Victorian kitsch, are more suited to a producer of the blood and thunder melodramas of Eugène Scribe and Victorien Sardou: his office is crowded with heavy, carved furniture. In the public spaces of his theatre, oil paintings in gilded rococo frames hang on walls that are covered in shimmering damask silk; fluted pillars and pilasters are topped by Corinthian capitals of exuberant gaudiness; heavy brocade draperies and swags trimmed in miles of fringe adorn every landing, niche, entrance; cut crystal chandeliers glitter overhead; there are Turkey carpets as far as the eye can see. It’s the vulgarian’s dream of high class. I imagine Boss Tweed must have looked on similar decor while being fellated at his favorite whorehouse, though he would not have seen a neon sign for the Cabana Café glaring through the bordello window. But if these trappings seem inappropriate for a producer of frolicsome romantic comedies, they are entirely correct for this Tosca-like opening and for the preposterous melodrama that follows. 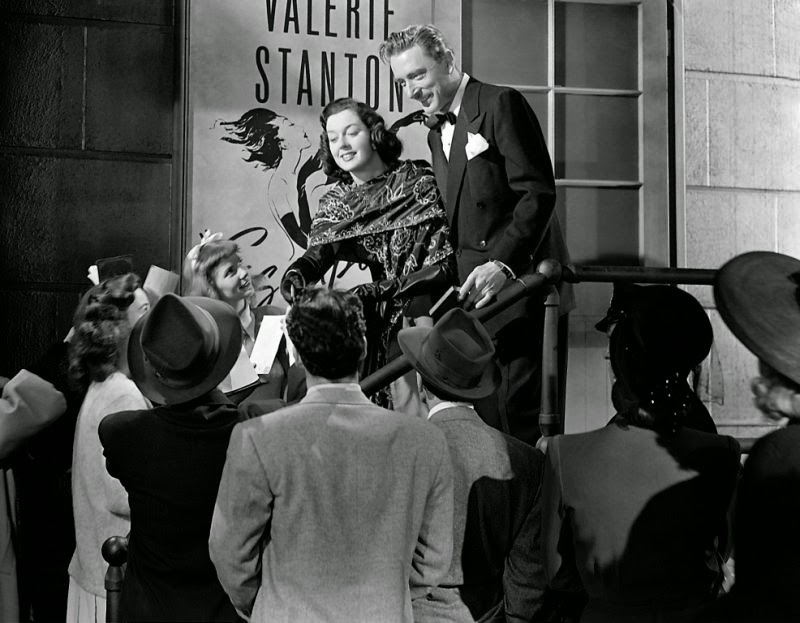 Rosalind Russell, Leon Ames: Valerie Stanton and Gordon Dunning in happier times. And just to make it quite impossible to take any of this camp melodrama seriously, there is the stupendously misleading title song, sung in glee-club harmony by an all-male chorus. Written by Mort Greene (lyrics) and Leigh Harline (music), the tune’s jaunty breeziness and idiotic fills (doodle-oodle-oo), lead one to expect the picture will be one of those late-forties disposable situation comedies in which, say, Robert Cummings vies with Brian Aherne for the affections of Virginia Mayo, while Marjorie Main cracks wise, and eggs, in the kitchen. Instead you get Murder on the Main Stem — part Fannie Hurst, part Edna Ferber, part Walter Winchell, part Sardou, part Dostoyevsky — and it’s a whole lot funnier than most of the comedies of the era, but in a sneaky, subversive way (perfect for the McCarthy Era). That is, it is definitely played as high drama — Rosalind Russell and her co-stars (most of them) seem to take it all in deadly earnest, but unless I miss my bet, the screenwriter was having fun at their expense. Anyhow, if you look at it from this point of view, the picture is hilarious, sometimes almost awesomely so. The picture was produced by Miss Russell’s husband, Frederick Brisson, and her great, elongated full-moon face is rarely out of the frame. Even so, Claire Trevor, as her bitter rival, acts her right off the screen. Moments after Roz flees undetected from the scene of the crime, the body is discovered by Claire Trevor, who makes two serious blunders: (1) she picks up the weapon, and (2) she falls into an hysterical faint. This is a sticky wicket, for it appears to everyone, including (or so it would seem) NYPD Homicide Detective Sydney Greenstreet(! ), that she — a woman scorned — must have fainted after having committed a crime passionnel. Meanwhile, Roz has her own fit of histrionics in the privacy of her home, where she sobs, “Oh why did this horrible thing have to happen? Why? Why? . . . Why?” Cue flashback. First we see how Roz tried to patch things up with Claire a few days before the bludgeoning. Roz is unusually restrained. Claire is (ahem) less so. The result is a nice bit of camp: catfight lite. Later in the picture, we learn that Claire has been hospitalized. Roz goes to visit her, amusingly attired as if she were a very chic nun in a satin and silk habit and wimple. She makes me think of Caitlyn Jenner as Father Christmas. Roz extends the olive branch, but Claire is having none of it. And to prove it, she speaks two of the greatest camp lines ever. The screenplay is by Leo Rosten, who wrote the best-selling “The Joys of Yiddish.” I have to believe that Rosten was laughing his head off when he wrote, “Where did you get your luck, Valerie? Or does God pity the wicked?” and “If you had any decency, you’d face it yerself. But you haven’t: yer rotten! All the way through!” At any rate, the brilliantly funny author of “The Joys of Yiddish” simply couldn’t have taken any of this stuff seriously. Believe me, I’m not knocking it. I think it’s great. But it’s great because it’s so funny. Much of “The Velvet Touch” is as fabulously, deliriously foolish as the best parts of “Deception,” and almost as entertaining. It lacks a towering, unforgettable performance to match Claude Rains’ supremely witty sadist Alexander Hollenius, but there is more than enough mad, grandiloquent silliness in “The Velvet Touch” to make it a thoroughly entertaining picture. For fans of Rosalind Russell, Claire Trevor, Leo Genn, Sydney Greenstreet, or for that matter, Leo Rosten, it is not to be missed. This entry was posted in Main and tagged 42nd Street, Alexander Hollenius, Alice Faye, All About Eve, Bill Sampson, Boss Tweed, Brian Aherne, Carole Lombard, Claire Trevor, Clark Gable, Claude Rains, Dan O'Herlihy, David Belasco, Deception, Dostoyevsky, Douglas Sirk, Edna Ferber, Eugene Scribe, Eve Harrington, Fannie Hurst, Frederick Brisson, Hedda Gabler, Hello Frisco Hello, Imitation of Life, Jeanette MacDonald, John Barrymore, John Payne, Lady with Red Hair, Lana Turner, Leigh Harline, Leo Genn, Leo Rosten, Leon Ames, Margo Channing, Marjorie Main, Maytime, Mildred Plotka, Mort Greene, Mrs Leslie Carter, Nelson Eddy, Nicolai Nazaroff, Oscar Jaffe, Robert Cummings, Rosalind Russell, Ruby Keeler, San Francisco, Sarah Bernhardt, Svengali, Sydney Greenstreet, The Velvet Touch, Tosca, Trilby, Twentieth Century, Victorien Sardou, Virginia Mayo, Walter Winchell, Warner Baxter on June 19, 2015 by TR.